Our friends at JL Wrangler forum just released spy photos of the upcoming 2018 JL Wrangler’s interior. The photos reveal a significant amount of information regarding the design and several rumored features. Here’s a breakdown of what can be seen in the photo. Picking up on what seems to be Jeep’s styling direction of the JL Wrangler, the interior has been redesigned, but maintains several iconic Jeep components. The dash board retains the flat upright stance, but now has a sleek color finish, which could be tied to the exterior color of the Jeep or provide additional styling color contrast. It has a rounded look like the Chrysler PT Cruisers and keeps the four-iconic large round vent openings that have become trademark Wrangler interior pieces. In addition, the gauge cluster seems to be separated into similar round pod openings as the vents and finished with a chrome accent. As mentioned in previous blog posts, the Jeep’s interior could feature one of three touch-screen display options, including a 5-inch, 7-inch or 8.4-inch screen. The spy photo seems to showcase the larger 8.4-inch infotainment system, which has a large screen interface that is prominently visible in the center of the dashboard and is rumored to have similar off-road gauges found on the 2017 Grand Cherokee. 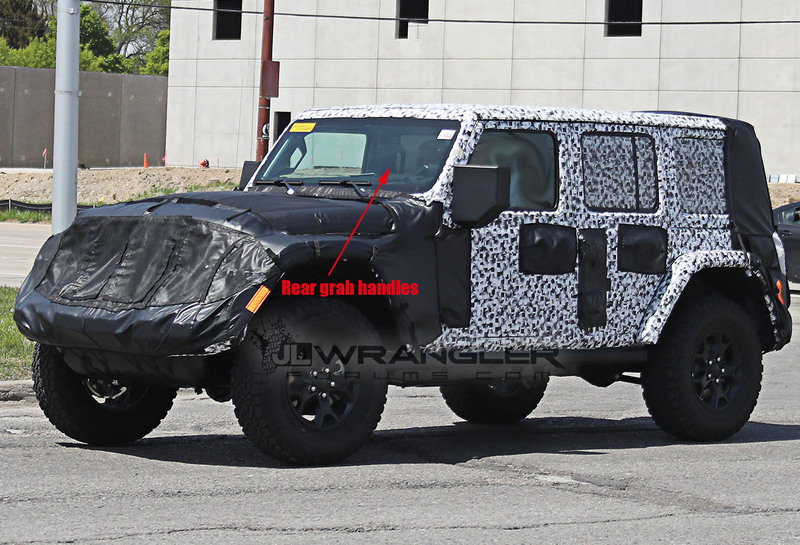 Earlier exterior photos showed the possibility of grab handles to make getting into the Jeep easier. This recent photo clearly shows the grab bar integration with the A-pillar in a nice finished look, that provides a great functional element to the interior. Following along the A-pillar, the overhead console is also very visible, highlighting homelink buttons on the visor and a latch/control lever for the possibility of the SkyView powered roof system. In addition, the rear-view mirror has a significantly stout stalk that comes down from the overhead console. It’s unclear from the photos what functions it could provide, but the size is larger than current auto dim mirrors and could house additional features. Among the most important portion of the interior spy photo involves the control buttons along the bottom of the center console. The series of buttons reveal several important options that could make their way into production. Auto Start/Stop: This feature was part of a recent proximity keyless entry report and can be seen in the bottom corner. Parking Sensor: The parking sensor button is clearly visible and an important feature to have. It will be interesting to see how the system is integrated into the rear of the Jeep and how it will affect aftermarket rear bumper designs. Off-road controls: The sway-bar disconnect buttons, typically found under the driver side vent on Rubicon models, has been moved to the more centralized location for a more unified cleaner look. Heated Steering Wheel: This is a great convenience feature found on higher –end vehicles and a welcome option in colder climates. Unconnect Controls: Larger dials along the sides seem to provide manual controls of the Unconnect system. Auxiliary Buttons: One of the most curious element of the button cluster is the series of four auxiliary labeled buttons. Could this possibly lead to a power distribution solution for auxiliary items such as lighting and air pumps? any thoughts to making radio a marine quality so that it is waterproof ?